SAL DeTRAGLIA'S VIRTUAL TAPAS BAR: WATER BOTTLE VIGILANTES DIVERSIFY. A few weeks ago, this blog broke the disturbing story of a water bottle lynching that occurred here in Cabanillas del Campo. Then—earlier this afternoon—I stumbled upon the gruesome scene pictured above. Ya know…it’s one thing to string-up a filth-encrusted Evian® bottle. But when people commit random acts of savagery against Pookie…that’s taking it too far! Somebody call the A-Team! I hear that Mr. T comes cheaply these days. In all seriousness (or, at least, as serious as I’m capable of being in print), this photo is of a vegetable garden located around the block from my house. 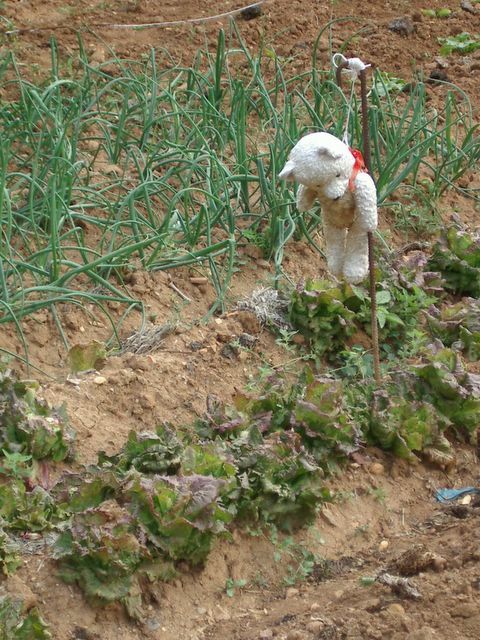 The owner—an energetic man in his ‘70’s—surely intended this teddy bear to serve as a make-shift scarecrow. I don’t know if it has scared any crows, but one thing’s for sure—it has definitely scared all the three-year old kids in the neighborhood. The Texas Teddy-bear Massacre. 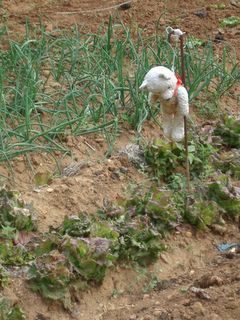 Keep your bear safe, don´t leave him alone..
Hi, all well here in Mojacar. I'm wondering if I can pinch an article, specifically the one on Speaking with the Neighbour. In the event, send hi res pic of Larousse plus author.. and address for yr copy of The New Entertainer plus a voucher to the world cheese-tasting competition in Oslo next week. This is hysterical, Sal. Simply hysterical, and I'm rather scared myself. My name is Julien. I am building a new website for expatriates, and will be the webmaster of www.expat-blog.com. In the last three years I have spent a lot of time travelling and living away from my home country, hence me setting up www.expat-blog.com. I had the idea to create a blog so I could share my experiences of living abroad and keep in touch with my family and friends. While reading other expatriate blogs the idea came to me to create a classified expat blog directory. This would include a free blog hosting platform with interesting features such as picture albums designed specifically for expatriates. I do not believe this would be in competition with existing blog platforms such as blogger. > The free Blog platform – this section will be completed by the middle of June. > An Expat resource directory - this will include all expatriate suggestions. This is the global presentation of the website. Do you think my project is a good idea? Would you like to add your blog in the expatriate blog directory?